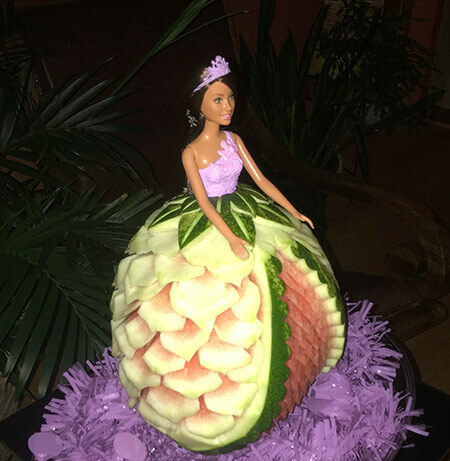 Princess watermelon Carvings are a fun, unexpected and healthy way to make a “cake” for girl’s birthdays. Especially during summer when watermelons are plentiful. You can use this ideas to surprise and delight your birthday girl. 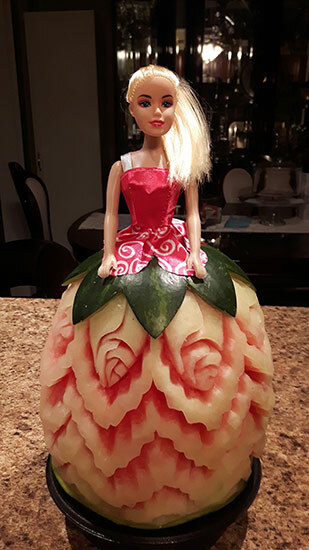 A while back I published a blog post with an idea for making Princess watermelon carvings using a Barbie doll with a carved watermelon for her skirt. Since that time, I’ve received quite a few more photos from my students showing their creative take on the idea. I’ll share them with you here. This first Princess watermelon was created by one of my past students who has since become a professional carver. 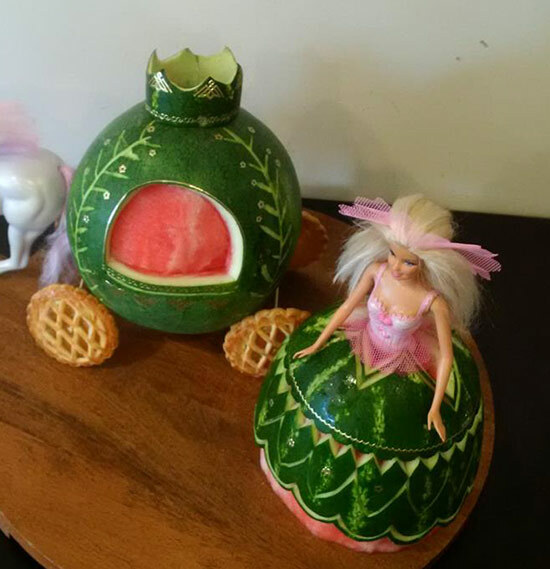 Past student turned pro, Panayiota Thoma, created this beautiful princess watermelon carving. She carved a rosebud pattern with cascading ruffles. For the skirt, she utilized the green outer rind as well as the white inner rind and the pink of the fruit. Notice how she cut the fabric of the top to match the shape of the carving of the green rind. Isn’t it lovely? You can learn how to carve rose buds like Yiota’s in our video lessons, Carving Watermelons -Roses, Buds and Leaves. These next two princesses have skirts carved to look like multiple layers of fabric with one layer open in the middle much like Disney’s Cinderella. 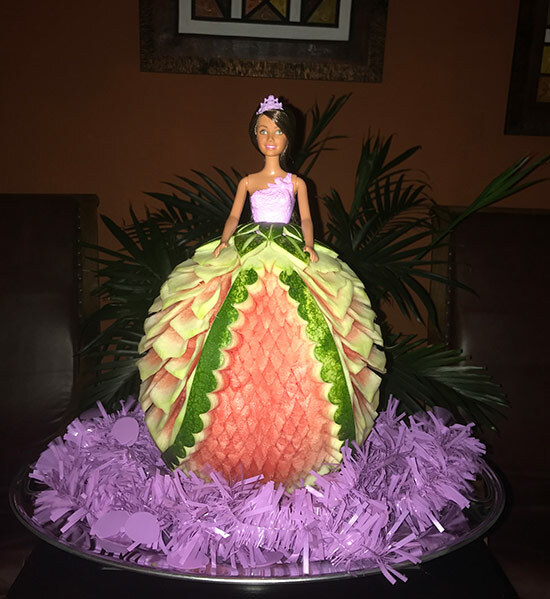 Customer/student Iris DeLaCruz made this lovely princess watermelon with a multi-layered skirt. 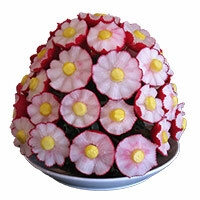 The large petals are taught in our video lessons, Melon Carving – Smooth and Jagged Petals. All of the lessons mentioned so far come in our 17 Lesson Collection. Watermelon Barbie Cake for my goddaughter’s 6th birthday. I had lots of fun with this carving. I really enjoy carving and so grateful for your lessons. They have really paid off in helping me explore my artistic side. It would be an honor to have you share my work with your readers!!! The top layer of skirt is carved in the shape of leaves, the outer layer has large flower petals. And the center, inner layer is carved with small petal shapes. Iris’ doll’s came with a bodice of plastic molded to the doll. Many Barbie dolls are available with molded tops. Here is a side view of Iris’ princess carving. See One Student’s Skills Visibly Progress! 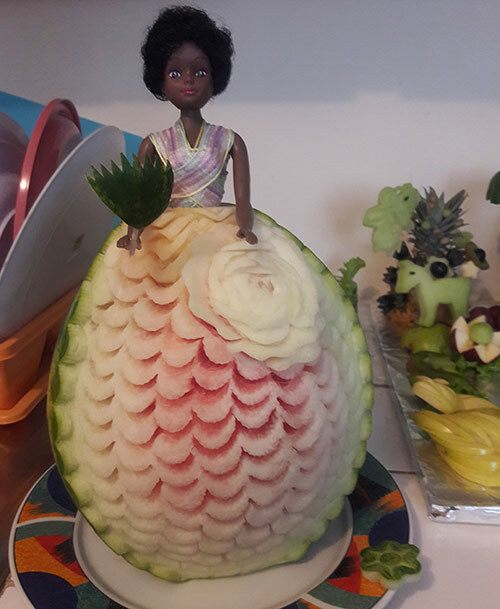 Kay Williams made this princess using a small watermelon. Notice how she wrapped the bodice with fabric and added carved grapes around the waistline. Now take a look at the princess watermelon carving that she made less that 2 weeks later. I am from Trinidad, and I enjoy you DVDs courses on carving. I and not perfect yet on carving watermelon flowers, but continual practice I’ll get there. I love carving and I also love a challenge. Less than 2 weeks after carving the princess above, Kay Williams created this beautiful princess. She added a pretty rose embellishment to the skirt. And, she draped ribbon to create the bodice for the gown. The wavy scallops on the front of the skirt are made with our Corrugated U-Cutters. As a finishing touch, Kay carved a fan from watermelon rind to put in the princess’ hand. It’s so clever and cute, isn’t it? 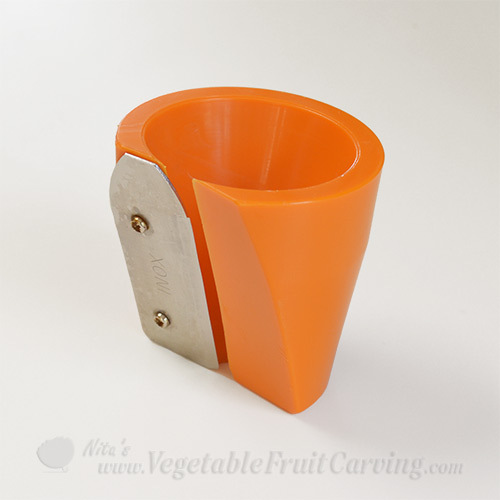 You can learn how to use our Corrugated U-Cutters in our video lessons- Watermelon Flower made with Corrugated U-Cutters. 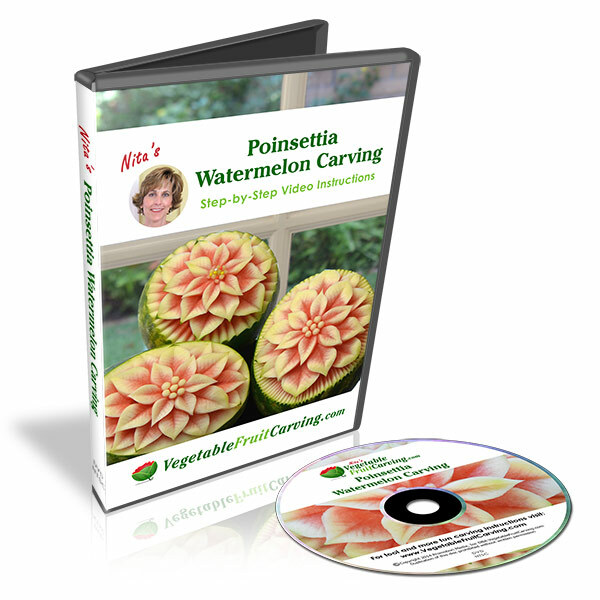 You’ll learn how to carve roses in our video lesson, Carving Watermelons -Roses, Buds and Leaves. Student/customer Hannah Perryman created the look of a multi-layered skirt a different way. She kept more of the green rind for the outer skirt. This look is visually appealing, too. Hannah Perryman created both the princess and Cinderella’s carriage and carved decorations into the green rind. Don’t the lattice cookies make great wheels? This top view shows how Hannah carved to top where the doll fit in and added a layer of sheer ruffle at the waistline to match the layer of ruffles in her hair. Student, Wilma Silva did something different. 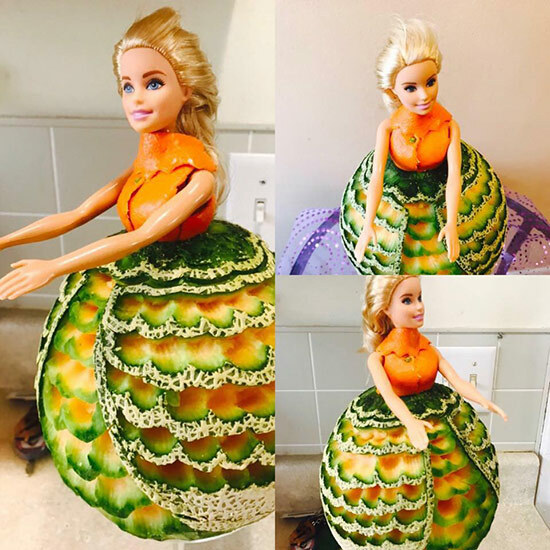 She carved her melon princess using cantaloupe. She also made multiple layers of “fabric” for the skirt. The ruffles in the skirt were carved using our Corrugated U-Cutters. I love how Wilma used a tangerine peel to form the bodice and collar. Then, she even cleverly added a green “button”. You can learn how to use our Corrugated U-Cutters in our video lessons- Watermelon Flower made with Corrugated U-Cutters. Marcia’s watermelon princess is carved very similar to Iris’ with a multi-layer look to the skirt. Marcia cleverly used strawberries to form the bodice of this princesses gown. 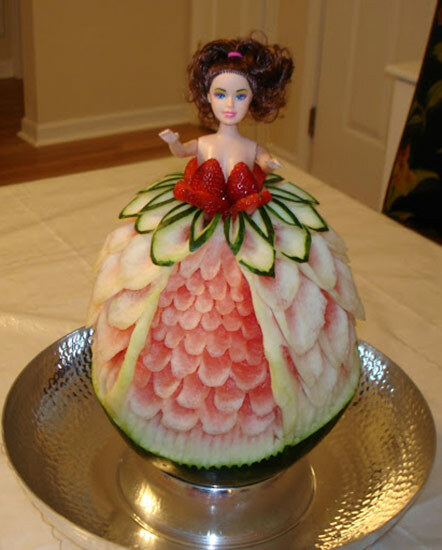 Marcia Geers made this pretty princess watermelon with strawberries for the bodice. 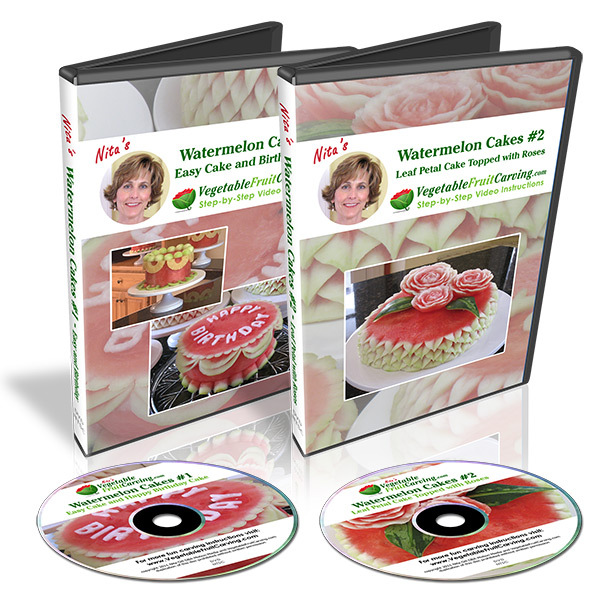 You’ll find an overview and ideas for making Barbie doll cakes here. The techniques used for carving various designs in the Princess carvings on this page are found in the various lessons of our 17 Lesson Collection. Some of the specific lesson are mentioned in the paragraphs above. Our Thai Pro knife is the best knife that I have found for making these types of watermelon carvings. You can learn more about our Thai Pro knife here. The wavy scallops in the skirts of some of the princesses on this page, are made using our Corrugated U-Cutters. 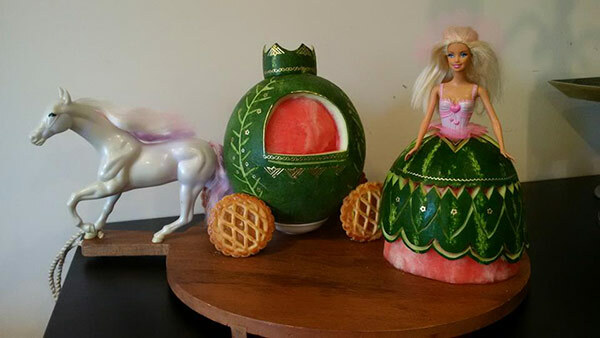 Make Your Own Princess Watermelon Carvings. 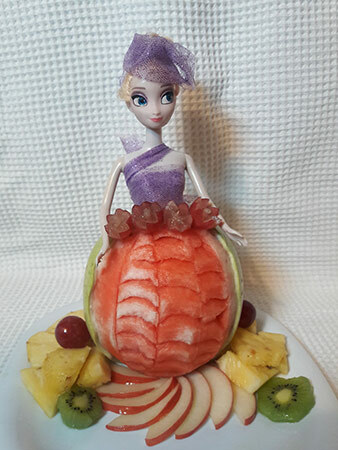 I hope that these photos of various princess watermelon carvings gives you the inspiration to make some of your own.